What should my next book be? This is the perpetual question of the long-distance commuter for whom electronic devices are mere distractions. If that commuter is socially awkward and believes that only books truly understand them, that is. I’m as eclectic a reader as I am a voracious one. Each book suggests, in some measure, the next one. I always have to keep an eye ahead. Then I read (present tense) a book without peer. I feel lost because what will replace that experience I’ve had for the past few days of looking up and finding myself at my destination? Of actually looking forward to getting on the bus so I can read? I’ve been doing this commute for over 400 books now, and I’m at a loss for what to read next. I blame it on Amazon. In the publishing world we use Amazon to purchase competitor’s books. Then Jeff Bezos decides to buy the Washington Post, you know, the way people do. Since my email address is on their list I get sent a daily invitation to read the most read stories on said Post. I read a story by Alexandra Petri and I was hooked. Where could I get more? A Field Guide to Awkward Silences is the rare kind of book that makes you laugh out loud on the bus, which, at six in the morning, generates its own kind of awkward silence. Petri makes you feel like it was actually okay to be that dorky kid who read all the time. Like there’s a world out there that responds to your longings, somehow. A world of possibilities. Now here I am about to climb on the bus without Petri. I’m like a kid staring disconsolately at an empty candy wrapper. “That was so good!” you think. “I wish there was more.” Petri writes as if she’s achieved Bob Dylan’s blessing and has stayed forever young. The time of life when the future seems so full of possibilities. Hers is writing that reminds you of a time when you didn’t spend hours a day nursing hemorrhoids, sitting on a hard bus seat. That reminds you it was possible, unlike your own experience of it, to be cool as an Episcopalian in Wisconsin. That reminds you of the time when you had A Field Guide to Awkward Silences to look forward to reading. No, this book didn’t make that choice of next book any easier at all. Barbara Brown Taylor is a name about which I wish to learn more. 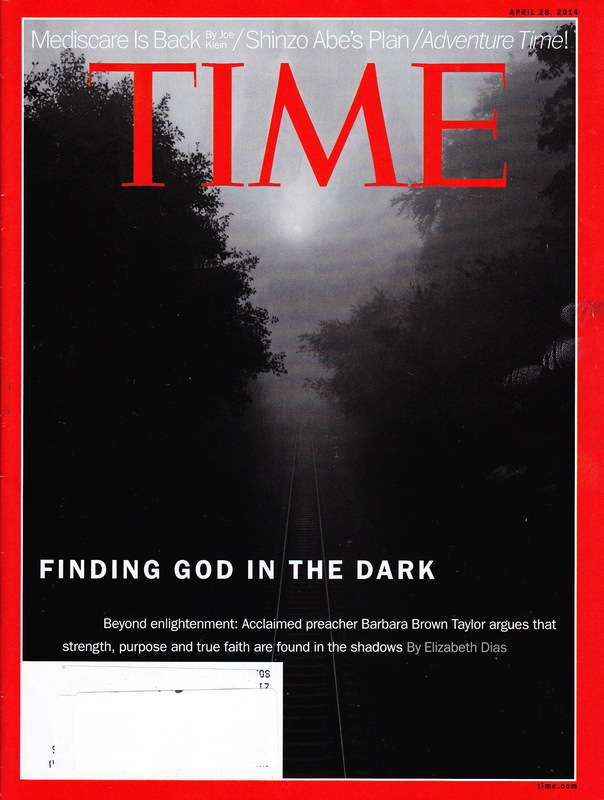 Although Time magazine predictably runs a religious-themed issue around Easter, the year’s cover story, “Finding God in the Dark,” hit some resonant chords immediately. A friend of mine writes a blog called Bleak Theology, and my own posts often linger in those nether regions where, if we’re honest, we don’t know what we might find. Barbara Brown Taylor has been exploring these themes for years on a spiritual journey that has her deciding, as many of us know, that the dark is not evil. Fear is a kind of spiritual elixir. I watch horror movies. I read gothic novels. I awake daily before the sun, and do my best thinking in the dark. The key, as I would humbly suggest, is to be honest about life. When I preached, the students who understood that would say they appreciated my honesty. After all, before the beginning, all was darkness. The article on Taylor, by Elizabeth Dias, is moody but appreciative. Taylor has the experience of being an Episcopal priest, a professor, a preacher, and a recognized author as her journey has led her to appreciate the dark. Some of us understand that the biblical books that are the darkest—Ecclesiastes, Job, and Psalms—are also the most honest. These are books to read in the dark. Nature has evolved us to trust our eyes for survival. Fear of the dark is not something instilled in humans by protective parents—it is a consequence of having to survive in a jungle where you too are prey. We can’t see well at night, so that is the time we close our eyes and make ourselves vulnerable to the nocturnal beasts. Those beasts are, of course, spiritual. Somewhere on our journey to shallow religions of the modern era, we’ve come to believe that religion is all about sunshine and light. Evangelicals often believe that feeling good is a sign of blessing and depression is from the devil. Religion, however, from the beginning, has not shied away from the heavier side of human existence. If all were clear and bright, what need would we have of religion? In our experience, however, life has a substantial amount of trials and difficulties. There’s a lot of fumbling in the dark. If we can learn, with Barbara Brown Taylor, that not seeing is true insight, we might indeed learn a lesson about life in a world that is dark, literally, half of the time. For never having been a Catholic, my life has been strangely tied to the Roman Catholic Church. Like many in my diminishing profession, I was raised in a religious household—in my case non-denominational Protestantism with a strong Fundamentalist streak—and have wandered a bit from my starting point. When my family moved to a small town with just two churches—United Methodist and Roman Catholic—we had no choice which to join. I learned the Methodists were just disgruntled Anglicans, and logic dictated that I would eventually join the Episcopal Church and gain a deep appreciation of Catholicism. My first professional job was teaching at an “Anglo-Catholic” Episcopal Seminary. 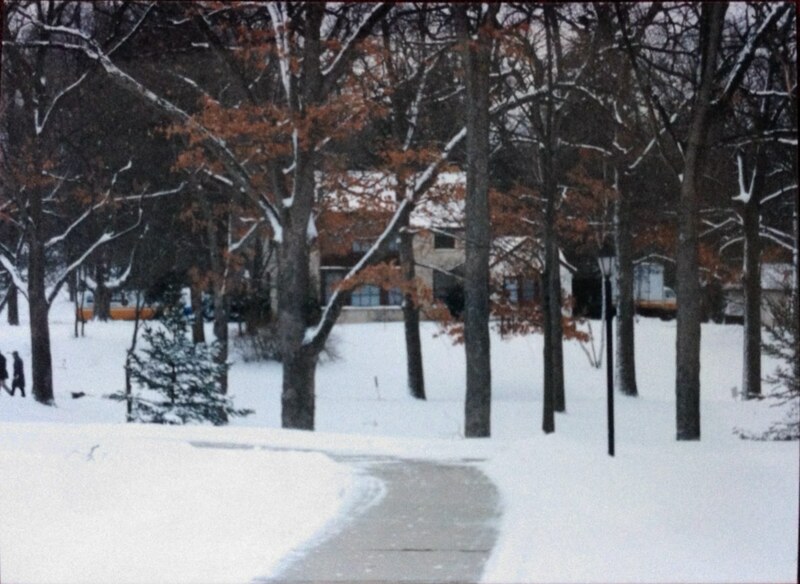 While there I was interviewed for positions at Roman Catholic schools, and not infrequently brought to campus: the University of St. Thomas in the Twin Cities, Assumption College in Worcester, Massachusetts, Sacred Heart School of Theology just down the road in Hales Corners, Wisconsin. Most of the time I was in the list of finalists when the position would go to a Roman Catholic, “no hard feelings, right?” Long ago the Episcopal Church, ironically, got out of the higher education market. It is with this background that I keep an eye on the Roman Catholic Church. Many friends and colleagues are Catholic and we have far more in common than I have with my Fundamentalist forebears. I frequently find myself in wonder at Pope Francis. Many church leaders have made the news over the past several decades, but few of them for such good. In an article on NBC over the weekend, the Pope called for seminary reform, noting that always toeing the line will turn priests into “little monsters.” I taught at Nashotah House for fourteen years, and I know exactly what he means. I encountered students who could quote Paul about being freed from the law and in the next breath lay down ecclesiastical law with enough force to behead a heathen. The Episcopal Church, which is small but disproportionately powerful, should take the words of the pontiff to heart. Pope Francis noted that seminaries need to keep up with the times. Indeed, the laity of most religious traditions have little trouble accommodating to culture while their faith remains mired in the Middle Ages. In a world robbed of essences and meanings, it is difficult to teach future clergy that the spirit of a faith can be honored in outwardly different ways. The idea that we can just hold on ’til Jesus gets back should’ve been questioned once Islam came to be a major force a few centuries after Christianity settled in. Since that time Christianity has fractured into thousands of sects united by little more than essences. Instead of settling in for the long haul as an empire, the Pope is suggesting that the church settle in as servants. That’s a radical idea. And it is one, if I read my Bible aright, that its founder would be pleased to find in force should he ever decide to return. As a preemptive warning to my regular readers (am I’m sure you both know who you are), I am off today for a stint in my old haunt of Scotland. Before you get out your congratulations, be advised that this trip is for work. The Society of Biblical Literature, in addition to the big meeting about which I sometimes post, holds an international meeting every year. Since my employers frequently want me out of the office, I am being sent to the fair city of St Andrews in the kingdom of Fife for a week. 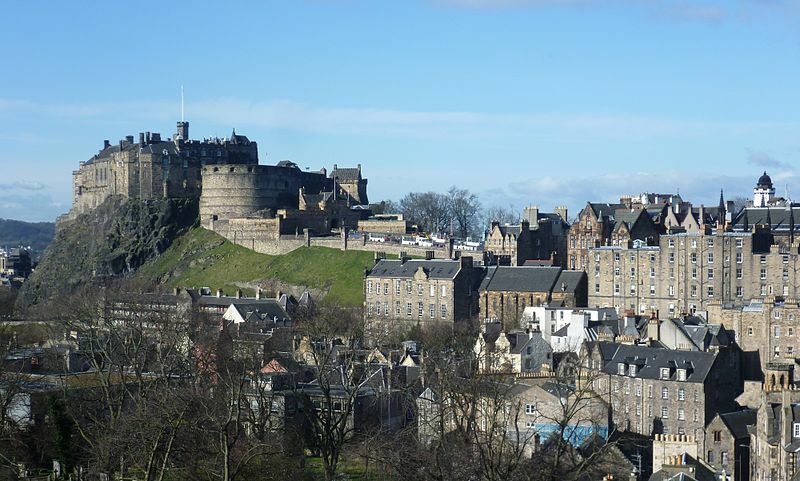 Although I studied across the Firth of Forth in the wondrous town of Edinburgh, I ventured to St Andrews a time or two during my postgraduate days. By that time anyone in tune with popular culture had seen Chariots of Fire, and it was almost a requirement of credibility to visit the famous beach on the North Sea where the actors iconically ran as the movie began. And as in Chariots of Fire, I’m not sure that wifi access will be readily available. Should I find access, I shall gladly update my blog with my customary observations. If I fall silent, you’ll know why. Scotland had a tremendous draw for me as I was contemplating where to complete my studies of religion (as if one ever can). Not that I was Presbyterian, and not that I have Scottish ancestry (although Celtic is represented in the Irish stowaway on my father’s side a few generations back)—it was the antiquity that drew me. One of the mysteries, to me, of new religious movements, is how people can believe in a religion that recently began. Should there be a supernatural, I’ve always supposed, and should that supernatural be concerned that humans have the truth, why wait so late in the story to start? It was such thinking that drew me from Methodism to its estranged parent, the Episcopal Church. Among the Episcopalians are many who argue for a continuity with the Catholic tradition, separated, literally, only by a matter of divorce. And Catholics go back to Jesus himself, a member of a religion so old that even the Romans grudgingly respected it (Judaism). I guess I’m guilty of old-school bias. So it was that I came to spend some years among the Presbyterians at Edinburgh University. The Ph.D. that I earned there translated to an unfortunately brief career doing what I’m best at—teaching. My tenure at Nashotah House never offered the opportunity to travel back to Scotland, or even England with its Anglicans. And as I prepare to board a plane across the Atlantic, although strictly for work, I can’t help but to reflect on those years of intensive learning, hoping to do my Scottish alma mater proud. And returning to the States to have my career shipwrecked on the rocks of unforgiving religious dogma. It may be that once I’m back among the heather and thistles, I may cast my laptop aside and try to claim religious asylum in a past that I can only see through rose-coloured glasses.